Sanctions remain high on the commercial agenda, with businesses keen to understand the nature of the restrictions; the extent to which they can trade with countries which are subject to sanctions; and how to ensure compliance. Sanctions against Iran – what effect will sanctions relief have? There is a great deal of focus on Iran and the EU Regulation which is due on Adoption Day, around 18 October 2015. The EU Regulation is expected to set out in more detail the precise scope of sanctions relief which will follow on Implementation Day, likely to be some time after April 2016. While the precise date for sanctions relief will depend on the speed and extent of Iranian performance under the Joint Comprehensive Plan of Action, many businesses are already considering whether the anticipated sanctions relief will result in meaningful opportunities for increased trade with the Islamic Republic, and decisions on how to proceed. We recently asked some of our clients about the significance of opportunities in Iran for their business and what the main barriers were to their business operating in Iran. 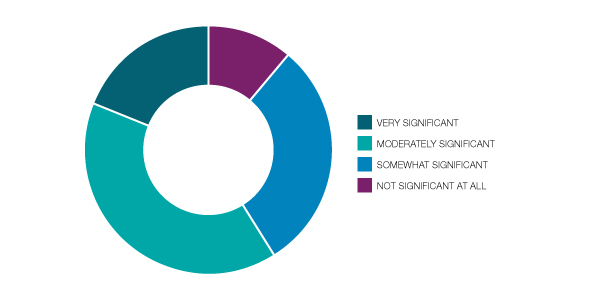 The following charts set out the findings in more detail. How significant an opportunity is Iran for your business? 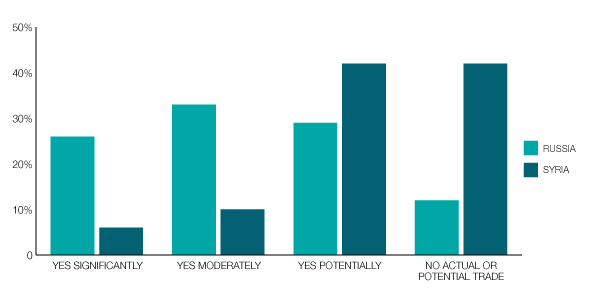 It was fascinating to see that almost 60% of respondents considered that Iran presented a “very significant” or “moderately significant” opportunity. This shows the level of interest in Iran and the potential for trade with Iran to increase if sanctions are lifted. Traders, shipowners, banks and insurers will of course need to be confident that they can engage in lawful trade without infringing the remaining restrictions. There is no obligation on the US to relax restrictions under US sanctions on US persons or US dollar transactions. The remaining restrictions for non-US persons and non-US dollar transactions relate predominantly to Iran’s ballistic missile program and human rights violations, and include a continuing asset freeze against certain individuals and entities. Significant due diligence and planning will therefore be required. What are the main barriers to your business operating in Iran? 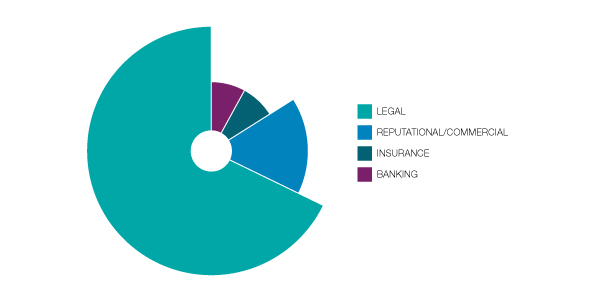 Almost 70% of respondents identified legal issues, as opposed to commercial/reputational, insurance or banking issues, as the main barrier to operating in Iran, showing the importance of getting the law right – particularly in this complex and dynamic arena. However, the other issues should not be downplayed. The availability of finance and insurance to support trade with Iran will be critical to the success of the sanctions relief. Other factors to consider when exploring opportunities in Iran include the need to get local input on trading requirements in Iran, the need to contract on suitable terms, and the need to continue to exercise appropriate due diligence, in light of the sanctions which remain. Sanctions against Russian and Syria – what effect are sanctions having? We asked the same clients about their level of trade with Syria and Russia. The tables below show the responses we received and the clear difference between clients’ exposure to Russia, where almost 60% of clients engage in at last some trade, and Syria, where the equivalent figure is only 16%. Do you trade with Russia or Syria? This difference in the amount of trade with Russia and with Syria shows the potential impact on EU businesses of further sanctions against Russia, and the need for businesses to keep a close eye on developments in this regard. These figures also show the potential impact on Russia of further restrictions, which may trigger further counter-measures from Russia, adding to the existing import ban on foodstuffs from the EU. Finally, the limited trade may have a bearing on the modest impact of sanctions against Syria, but it is clear that trade with Syria could potentially increase significantly. In order to assist clients to navigate the complex web of trade sanctions, we have prepared a special report which explains how your business can build an effective risk management programme. Please click here to view this report, hard copies are available on request. 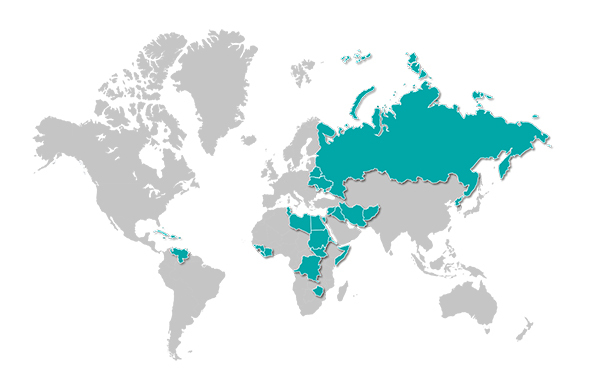 Sanctions have never been more complex or dynamic, with numerous programmes in place. The map opposite shows the large number of countries which were subject to some degree of EU or US restriction as of September 2015.